This month I want to know how you do your horsey shopping. Do you go to brick-and-mortar tack stores, or do you shop online? I’m sure many people do some combination of both. Please vote below, and feel free to comment with details. Are there certain things you only buy in store or online? Do you go to tack stores, or do you shop online? I’m putting down 100% tack store, though every so often I do buy items online. My good friend and barn-mate works at a tack store, so by shopping there I help support her job and a local small business. However, ironically, I rarely make it into the actual brick-and-mortar store. They take phone orders and have my credit card on file, which is dangerous but handy. My friend graciously brings my purchases out to the barn for me, which saves me a 45 minute drive (each way! “local” is relative). Best part: she also picks out everything for me – it’s like having a personal shopper! The items I do buy online are specialty products, such as the Viva Carlos Sweet Lemon Higher Standards leather soap, or Keratex products which the local store doesn’t carry. In terms of cost savings, generally speaking its a few bucks more to buy something at this tack store rather than online, even with shipping costs factored in. But the tack store has regular sales, an excellent consignment area, and of course I want this store to stay in business and so I support it with my purchases. We don’t have any big-box tack stores in my area (such as a Dover, etc), so pretty much all tack stores are local, small businesses. It is likely that the poll results were somewhat skewed by people with multiple horses – I probably should have asked for for bridles-per-horse or something. Plus I did specify “own” instead of “use” which skewed the numbers as well as it turns out lots of people use one bridle but own several. Turns out the overwhelming majority do NOT have bridles reserved for shows only! Frankly I was surprised by this, but also comforted since I do not own a separate show bridle. Thank you very much to everyone who voted on the last one, and to those voting on the current poll! For some reason I don't see a submit button on your poll, but I'm 50/50. Local stores don't tend to have items in my size and I like to price shop for more expensive things. Thank you for the heads up! I fixed the poll code. I TRY to buy locally, but the best close tack shop is horrible with ordering things in and since I'm tall and Stampede's large I would have to order in a lot. For examply: I actually tried to order Ogilvy stuff through them last year in January and they first forgot to submit my order, then submitted it wrong. I called Jack Ogilvy and he brought my pads to Rolex for pickup in April! That said I'm sure I still spend plenty of money there on various horse supplies, but the size issue tends to leave my more expensive purchases to be done online. I try to support my local people when I can, but realistically I'm on a budget and things tend to run a little high at our nearby tack shops. So probably majority online, with some in person purchases when it warrants it! I tend to buy simple things local that would have freight shipping, fly spray, lunge whips, etc. But really things like blankets and breeches are cheaper online out here. Now if I lived closer to a Dover..that would be different. I buy most of my stuff online because the variety is much wider. However if I need something you can get anywhere, such as a grooming tool, tack cleaner, or treats, I just get them from the store. I'm about 50-50, just like books. I love supporting local businesses that i think do a good job and will go out of my way to special order from them. Like i recently special ordered riding gloves from a brick and morter. Could I have gotten them on SP sure, but then I'd need to wait for my SP so I could get free shipping vs paying for more. It helps I work by a nice tack store, it is nice i have a friend who works there too. And the tack store by our barn gives you 10% off if you ride wiht a trainer, I can also have my trainer pick things up and get charged later *(which works best for me) they don't always have what I want but I try to support them. 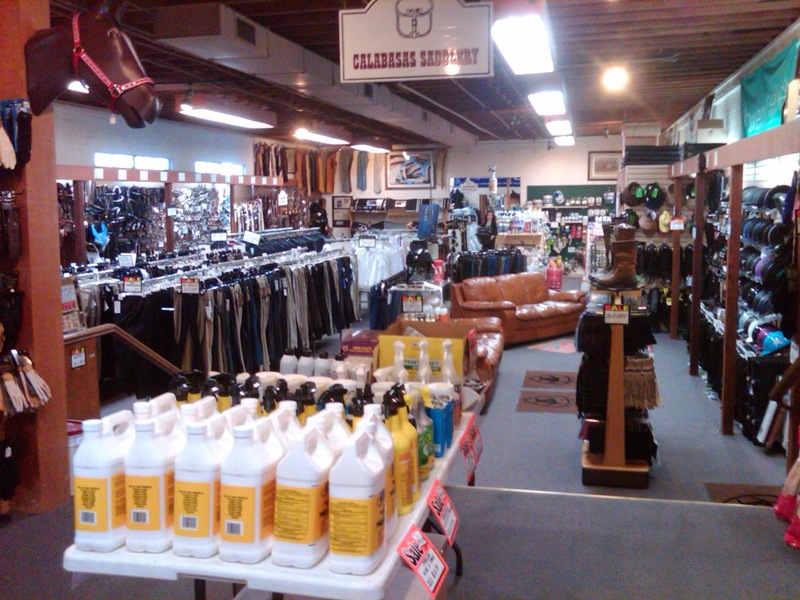 I would love to shop locally but I don't have a tack store with a large selection in my area that I enjoy going to. Every few months I make a list and stop in but inevitably they're out of at least two things I NEED and don't have really have a selection of fun impulse buys (like a new saddle pad) that make continued stops while I wait for needed items worth the trip. When I shop I'm usually buying from SP- they have a nice shipping policy and I think their site is very consumer friendly. I wish there was somewhere local that I liked and wanted to support. Unfortunately there isn't, so almost all of my shopping is done online. There also in an option C though – mobile tack shops. That's where the other % of my business goes. I would prefer to support local tack shops in the cities I move to throughout the year, but I'm rarely able to find what I want at them. In Denver there is a Dover, but the customer service is horrendous. The only one I've found that I like is in Phoenix and I mosy like it because of the clothing section, not so much the tack. So, I mostly buy online, but I try to buy from smaller stores with a website when I can.